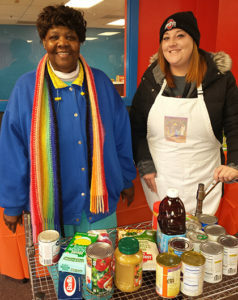 City Gospel Mission’s Thanksgiving Exchange is a grocery store for people with very low-incomes. Participants are referred by local churches and pay $10 to shop for their Thanksgiving groceries. The Exchange empowers shoppers to celebrate Thanksgiving with their families without destroying their extremely tight budgets. Each Thanksgiving, we provide food for more than 400 families in need. In total, our Thanksgiving Exchange helps provide more than 4,000 meals each year. We partner with local churches who refer the people, whom they know could use the help, to shop at the Thanksgiving Exchange. The churches use the Thanksgiving Exchange as a tool to build deeper relationships with those families, and they commit to following up with them throughout the year to assist their physical, social, mental, & spiritual growth and health.